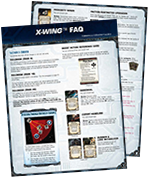 Again, I'm trying to catch up on old business here, but in case you missed it, FFG released a new version of the X-Wing Miniatures FAQ a couple weeks ago and I need to talk about it a little bit. First, and again, most appreciatively, FFG's FAQ for X-Wing is cumulative, so you don't have to maintain a library of the past FAQs to have everything that's been FAQed and errata'ed up to this point- everything that's been ruled on is always included in the latest edition. Additionally, the new stuff is added in pink text, so it jumps out at you if you're familiar with the previous editions. As usual, I'm just going to hit some high points that piqued my interest that y'all might find noteworthy. Prox Mines that are dropped on a ship don't go off until the ship the Mine Token is under moves off of them. Goes on to say that a ship can only overlap the token if it executes a maneuver, Decloaks, or performs a Barrel Roll or Boost Action. Also Huge ships (Transport, CR-90) have to overlap a Prox Mine with their base to set it off, not just their template. Large ships (the YTs, Shuttle, Firespray) that possess the Barrel Roll do it a little differently than the smaller starfighters- instead of placing the short edge of the 1 Straight template on the side of the Barrel Rolling ship's base and moving the length of the long edge, you turn the template 90 degrees and use the long edge up against the side of the ship's base and move the length of the short edge of the 1 Straight template. If a model pulls a Square maneuver (stationary) and begins its turn touching another model, the two models are not considered to be overlapping even though they remain physically adjacent. In Competitive Play, if a player wants to look at a dial he has finished his Planning Phase, he has to inform his opponent. In Competitive Play, if you get your dials mixed up and assign a B-Wing dial to your A-Wing or something, you're ok so long as the maneuverable is executable by the ship according to its correct dial. If you get your dials mixed up and you've selected a maneuver that isn't normally available to that ship, your opponent gets to pick a new (legal) maneuver for that ship. In Competitive Play, if your dial doesn't clearly show your chosen maneuver, i.e. it's showing the blank between two maneuvers instead of clearly indicating your chosen maneuver, your opponent gets to pick between those two maneuvers. In Competitive Play, if you knock a ship over, replace it as best you can, but your opponent has final say over where the ship ends up though he too must be trying to replace it in its original location as best he can. When Echo Decloaks, you're supposed to say which side and direction she's Decloaking. That said, if you cannot Decloak to the chosen side, you can choose the other side instead, or choose to not Decloak at all. If Corran Horn destroy's Fel's Wrath, Fel's Wrath stays on the board until the end of the following round's Combat Phase. Also, if Fel's Wrath is destroyed, but your opponent loses the rest of his ships in the same turn, the player running Fel's Wrath earns a Modified Match Win. If Colonel Vessery spends his Target Lock to lauch Missles at a ship that has him Target Locked, he immediately acquires a new Target Lock and can use it to modify his roll that turn. Corran Horn's additional Attack happens in the End Phase, but before you remove all the unspent Focus and Evade tokens from the board. If Porkins removes a Stress Token from a red Maneuver via his card text, he does not skip his Perform Action step. Because of timing intricacies, Night Beast can still get his Free Focus Action even if he overlaps another ship, but if he's Stressed and pulls a Green, he doesn't (though he'd still get his normal Perform Action step). Rexler Brath flips cards face up after resolving the effects of any face up Damage cards from his initial Attack. This means that any cards that were face up, but then were flipped face down (due to Chewie, etc. ), actually do get flipped back up as his ability triggers after all that business. Similar to Echo's Decloaking, Lieutenant Lorrir has to nominate which side and direction he's going to Barrel Roll before he tries it, but if he can't complete the Roll, he can choose the opposite side or choose not to Roll at all. Wes Janson's ability doesn't kick on until after his Attack has been fully resolved. In other words, the defender doesn't lose a token until after that particular Combat Phase completes. The Free Cloak Action provided by Advanced Cloaking Device doesn't work if the ship bearing it is Stressed because Stressed ships can't Cloak. Munitions Failsafe can work with Cluster Missiles, but both Attacks have to miss for it to trigger. If a Phantom uses Advanced Sensors to Cloak, it can't immediately Decloak. Draw Their Fire doesn't pull crits from Darth Vader, Crew Member or Proximity Mines as those technically aren't Attacks. If you have both C-3PO and Flight Instructor, you can make a guess on how many Evade results you'll roll, add an Evade result if you guessed right, and re-roll the dice (if applicable). Like many of y'all picked up on, Flechette Torps use the target ship's "starting" Hull value to determine whether or not they cause Stress. Additionally, if you have Munitions Failsafe on a ship with Flechettes and you fire them at a ship with less than 4 Hull and miss, the defender gets a Stress Token and you keep your Flechettes. The auxiliary firing arc on a Firespray works just fine with Outmaneuver. If your template and/ or base covers multiple Proximity Mines, they all detonate even if your ship was destroyed by the first one. If you've got R2-D2, Crew Member on a Huge ship, both the Fore and the Aft have to be stripped of their shields for R2-D2 to kick on. Ships with multiple Tactician Crew Members convey multiple Stress Tokens- 1 Token for each Tactician. A ship with Tactician and Gunner gives a Stress Token if the first Attack misses. A WED-15 Repair Droid can fix either section of the ship he's Crewing, but he uses up the Action for the section he repairs. He can also be used to repair a Damage card on a Crippled area of a ship, but the area remains Crippled even after the card is removed. A Huge ship can be deployed on top of an Obstacle, but it gets a face up as soon as it executes a maneuver. Defenders have to roll defense dice and Attackers have to roll Attack dice. Ships don't have to Attack, and they can't Attack allies. Cloaked ships that are Ionized cannot Decloak. Huge ships in Missions start with 0 Energy. Huge ships in Epic Dogfights or Epic Tournaments though start with full Energy.